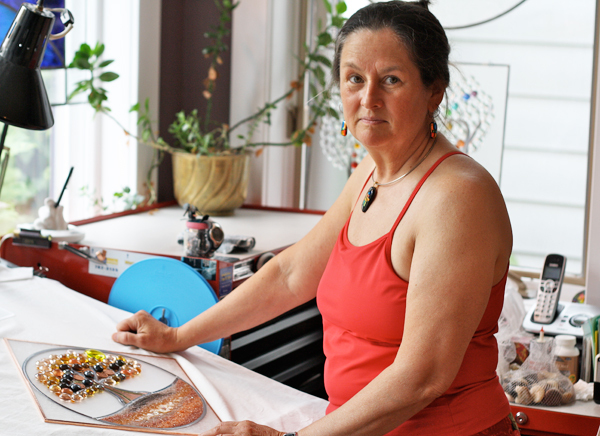 Westboro artist Lynette Chubb is a long-standing participant in the West End Studio Tour (WEST), having been with tour since its second year in 2001. Each year the artist shows work that differs from the year before. “There is always something new,” she says. Westboro’s Lynette Chubb has been with the West End Studio Tour since 2001 but there’s always something new at her studio. Photo by Anita Grace. Chubb’s art is designed to be hung or mounted so that natural light streams through it. Although it resembles stained glass, it is actually made with museum-grade, clear sheet acrylic, lead, glass paint and embellishments. She needed a medium that would allow her to create what she envisioned, instead of being limited by what the glass could do. This led her to clear acrylics. “I am also a paddler,” she adds, noting she does a lot of water designs. She recently returned from a five-week canoe trip in Northern Quebec where the caribou she saw inspired a new series of work. With acrylics, she is able to create intricate and flowing designs that take inspiration from nature as well as from her Celtic and Canadian roots. She is also able to craft pieces that are very unique, since few others are making this type of art. As part of the studio tour, Chubb displays pieces in different stages of production so she can show how she puts her work together – a process that involves drawing on the paper backing of the acrylic, then cutting and peeling off the paper in pieces as she applies different colours of paint. The final step is the application of lead, which she bends and shapes into its pattern. She jokes about her metal-bending strength: “I’ve got a good right arm,” says Chubb. Chubb says her experience with WEST has always been positive. For more information about Lynette Chubb visit acrylart.ca or westendstudiotour.ca.